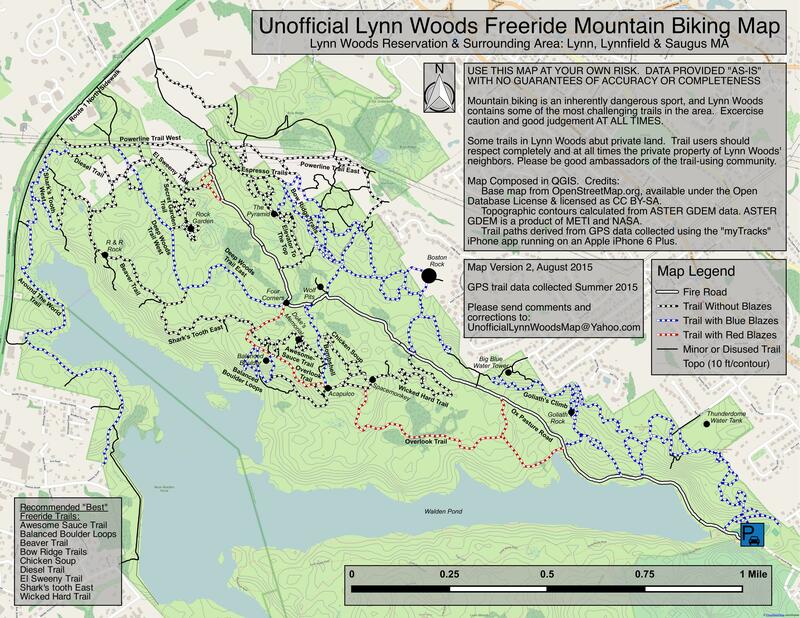 Every local mountain biker should experience Lynn Woods! After living in the Boston Metro Area for three years, I have developed a list of thrity places within thirty minutes of the town of Arlington that I like to ride, some of them well known, many not known at all. Out of all of them, nothing is better then a day at Lynn Woods. Lynn Woods, as the name suggests, is nestled within the town of Lynn Massachusetts. For those who are unfamiliar with Lynn, it is a low income industrial town about ten miles north east of Boston. If you were to drive through the somewhat run-down center of town you would never guess that you were close to best mountain biking Massachusetts and even New England has to offer. Lynn woods is quite large, although I am not certain, I would estimate it to be at least 2,000 acres. The park consists of three lakes, the largest of which (Walden Pond, no, not the one made famous by Thoreau), divides the reservation into two distinct sections. To the South of Walden Pond is a maze of fire roads and single-track that even after two years of riding, I still find confusing. The terrain on this side is mostly easy to intermediate, and a lot of fun to explore. For the explorer there are two places that are of particular interest; the stone tower, and Dungeon Rock. No more then a 1/4 mile from the main parking lot, directly up a long steep hill is a 5 story stone tower, built in the 1930s. From the top of this tower one can get a majestic view of the Atlantic Ocean as well as a clear shot of the Boston skyline ten miles to the south. The climb to the top can be an adventure in its self, and don't be surprised if you find a few not-so-polite local teenagers hanging out on the roof. Heading down the other side of the hill with the tower for another 1/4 mile or so you will encounter Dungeon Rock. Created by a treasure hunter in the 1800s, Dungeon Rock is cave blasted into and beneath an enormous boulder. As the legend goes pirates supposedly buried treasure underneath that rock, and some poor sap spent his entire life searching for it, by digging his way through solid rock. Although he was not successful, the treasure hunter did leave behind a very interesting piece of work. The entrance to Dungeon Rock is sealed with a cast iron door, that is supposed to be locked. However, every time I have been there the lock on the steel door was broken (probably a service provided by the same kids that hang out on t he top of the tower), and entry was possible. It's dark in there! To the north of Walden Pond are the trails that make Lynn Woods unique. If you are new to the sport of mountain biking you probably won't want to ride on this side. To those who are experienced technical riders, you will never want to leave. The best way to describe the terrain is ROCKS! Yes everything from small loose gravel, to boulders the size of a small house. It is awesome. If you are new to this type of terrain it will take a little getting used to, but it will be worth it. Personally, I like meandering over the huge boulders that dot the landscape. For those who are interested just head up the hill towards to water tower, and follow the white dotted trail from there. The water tower can be easily seen from any clearing. This trail is nothing short of amazing. On a sunny Saturday, don't be surprised to pass fifty or more other riders in this area, it has become quite popular for good reason. Have a blast, and although it may not seem like it the first time you ride it, it is possible to ride the entire white dotted trail without falling. Get on I95 North. Take exit 44B for Lynn, Rt 129 East. This will dump you on a rotary, just continue to follow the signs for Rt 129 east. After you go about two more miles, a small road will go off to your right, which will be marked with a sign for the Larry Gannon Municipal Golf Course. Follow this road for about 200 yards until it dead ends into a parking lot with a baseball field on the side. This is the entrance to Lynn Woods. About 200 feet off the end of the parking lot will be the tail end of Walden Pond. To the left is the bulk of the reservation, including Dungeon Rock. To the right is the technical terrain that makes Lynn Woods awesome. Leave a lot of time and try both! There are two maps at the top of this page. The first is the Town's Lynn Woods map while the second focuses on the difficult "freeride trails" in the eastern section of the park. Mountain bikes are prohibited on trails between January 1st and April 15th. For those who like an adventure, the fun does not end within the confines of Lynn Woods. In the past few years, I have found a way to ride primarily off road from Lynn Woods to Salem Woods, which is some five miles away. The ride inbetween is some of the most challenging terrain I have yet been on. Although I do not want to give the whole secret away, I will tell those interested how to get started. On the North side of Walden Pond there is a set of powerlines that traverse Lynn Woods, anyone who spends anytime there knows what I mean. Get on the trail underneath them and follow it out of the reservation heading AWAY from Rt 1 (be weary of kids riding motorcycles). Eventually you will hit a residential road. The powerlines will cross over that road and continue on the other side. That section is impassable, do not bother to try to ride it. Turn right on that road, then take your immediate left. Go one block and you will be on Rt 129. Turn left and you will hit the powerlines again. You will be able to pick up the trail again at that point. After about 100 yards you will be on another residential road. Turn right, go about 100 feet to the end of the road. Turn right again. Go for about 500 feet and take a left. Follow that street for about 1000 feet to the end (it is a pretty serious uphill climb). You will come to a dead end, after which will be the same powerlines again. Get back on the trail and enjoy a fun and very technical ride. This trail goes on for quite awhile. Although I am not going to give any more detailed directions, those adventurous types that are diligent in following the powerlines, will eventually hit a large (500 acres) area of wooded land owned by Eastman-Kodak. Many of the trails here have been blazed by motorcycles and you will find various downhills with banked curves (pretty scary stuff if you can keep your hands off the brakes). This place is a lot of fun! From there it is possible to take a trail that will lead in the direction of Salem woods, but that is all I am going to tell.